Have you ever wondered what it would be like to take a look into the future and see what awaits you? Do people with psychic abilities fascinate you? Do you think your life would be different if you could gain a vision of events before they actually happen? If you answered yes to any one of these questions, then listen and listen good because what I’m about to share with you is sure to captivate and amaze you at the same time. The ability to see into the future is certainly nothing new. People have been doing it for centuries. In fact, many of the events predicted by Nostradamus are still being talked about today. Essentially, having psychic ability is nothing more than having the ability to discover information that is unknown without using any of the five senses. For this reason, people with psychic abilities are said to have a sixth sense. In reality however, it’s not that they have an extra sense, they’ve just simply activated the sixth sense within them. Everyone has the ability to do this. They just simply need the tools and the system to do so. And luckily, I have both of them. 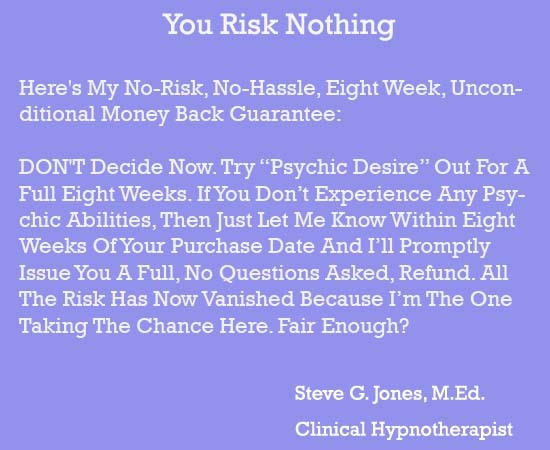 My name is Steve G. Jones, clinical hypnotherapist, and I have been effectively helping people unlock the psychic ability within themselves for most of my life. Using the power of hypnosis, I have been able to help people reach the alpha state where I can implant certain messages into their subconscious mind. This opens the door for endless possibilities, in both the physical and the meta-physical world. Many years ago, people began coming to me because they wanted to unlock the psychic power with themselves and so I created a system that I could use during a private hypnosis session that would enable them to do so. The only problem is that a private session costs $25,000 and it involves a trip to my office in Savannah Georgia. I thought to myself that there must be an easier and more affordable way to do this. That’s when I decided to put my education in cognitive psychology (the study of how people learn) to work and create a program that people could use whenever they wanted to achieve the same state; with the same result. 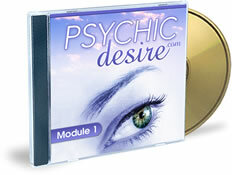 The History Of Psychic Power – Here you’ll learn exactly how people began to unlock this phenomenon within themselves. Enhancing Your Psychic Ability Phase One – Using the power of meditation, you will heighten your sense of intuition so your journey can begin. Enhancing Your Physic Ability Phase Two – Using the power of hypnosis, you will now include visualization into the process of your psychic journey. The Art Of Clairvoyance – Discover the five types of clairvoyance and how to experience all of them to the highest degree. Mediumship Mastery - Here you’ll learn the truth about communication with spirits. Essentials Of Psychic Reading – Here I’ll cover everything from tarot cards to numerology to ensure you are covered in every capacity. The time to unlock the sixth sense within you has finally arrived in the form of a program unpatrolled in it’s ability to provide you with a clear vision of the future. For just $27.97 which is less than the price that you would pay to visit a psychic, you unlock your own ability to see the future. Call it a feeling or a sixth sense, but Extra Sensory Perception (ESP) is a real part of the senses. ESP just may not be as developed or utilized in some people compared to others who have sharpened these skills. Hypnosis, with its ability to tune out distractions and create a keen awareness, is an effective tool in fully developing ESP. There has been experimentation regarding the ability of people to develop ESP. In a test conducted by a psychology major at the University of Cambridge, Carl Sargent, the theory was played out. He took a group of 40 students none of which claimed to have ESP. Half of the group was tested against a pack of 25 Zener Cards which are used to measure ESP by psychologists and to conduct experiments for ESP. Historically, the cards were used to see if someone was clairvoyant. The cards which feature 5 different shapes and designs are shuffled and then left for the subject to guess which card is currently being held up. Probability would state that random guesses would have a correct response 5 out of 25 times. That was the case with this control group. On average each student guessed 5 correct out of 25 cards. In the test group the results were much different. This group was first hypnotized and then set to the task of telling what shape was on the card. Here, the average score of correct “guesses” was 11.9 out of 25, or almost half. Sargent interpreted these results to mean that ESP is able to be exhibited when the mind is completely relaxed and therefore more open to this deep-rooted level of consciousness. 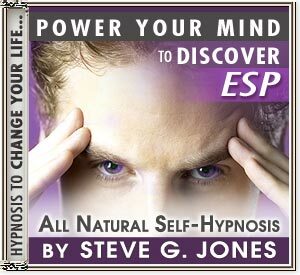 Steve G. Jones, a certified clinical hypnotherapist, has been able to unlock the ESP ability in many through his self-hypnosis program, “Develop ESP.” Through hypnosis, Jones is able to help the listener relax completely and develop a sense of awareness and perception that currently lies dormant within his or her mind.